A bunch of passionate locals, whose mission is to share our beloved New Zealand with likeminded peeps from across the globe. It’s easy to get swept up in travel - that’s the point after all. When you’re in the travel moment you don’t want to sweat the small stuff: how you’ll get there, who you’ll go with or where you’ll stay. 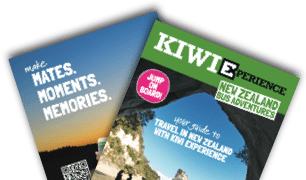 Whatever you want to get out of New Zealand, Kiwi Experience gives you what you need and delivers you the freedom to #EmbraceTheUnexpected moments that happen each and every day while you travel across New Zealand with us on the ultimate guided bus adventure. Be that through meeting your new best friend, screaming your way back to earth during a skydive, conquering that MASSIVE mountain (which the locals call a hill…) or being challenged by a new cultural perspective. So what are you waiting for? It’s your time to #embracetheunexpected in this mind-boggling wonderland we call Aotearoa. At Kiwi Experience, we are all about adventure, fun, exhilaration and excitement. If you’re looking for a relaxing 2 weeks by a pool, this is not for you. It’s your time to break out of that comfort zone. Embrace the butterflies in your stomach, stars in your eyes and perhaps a few early starts. This is what travelling is all about, and we LOVE it!